Most of us are dependent on sat navs, but with news stories about drivers ending up on train tracks, in rivers, or hundreds of miles from their destination, it seems we aren’t very capable of using them correctly. Here at Leasing Options, we surveyed drivers to find out what they really thought of satellite navigation. We asked both younger and older generations to uncover how they’d feel about driving without a sat nav or map application and, in case their tech fails, do they bother to bring a backup? Plus, we put drivers to the test to see how they manage routes around the UK without their trusted tech. Over 3 out of 5 young drivers would never drive somewhere new without tech help, yet almost 80% admit they’ve gotten lost using a sat nav. More than 1/3 of drivers think using a sat nav or map app has made their sense of direction worse. This gets worse for older drivers – over 4 in 5 motorists aged 35+ said using a sat nav or map app has diminished their sense of direction. Fewer than 20% of 18-24 year olds carry a paper map in their car – and only 1 in 20 have ever used one at all. 97% of 18-24 year olds would feel stressed if their sat nav or map app stopped working when driving to a new destination. More than 3 in 5 young drivers wouldn’t travel anywhere new without a sat nav – but still get lost anyway. Even though sat navs have been around since the ’90s, it appears 18-24 year olds still haven’t quite gotten to grips with them. Almost 80% said they’d gotten lost using a sat nav or a map application, which is ironic when you consider how sat navs are supposedly one of the easiest, simplest types of tech – your grandparents probably have one fitted as standard in their car. What’s more, even though young drivers can’t follow their sat navs properly, they’re still heavily relying on them. A shocking 3 out of 5 18-24 year olds said they would never drive somewhere new without the help of a map app or satellite navigation. Though it’s no wonder they don’t feel confident if they’re letting a machine do all the work for them. On the other hand, we can still trust the older generation to put young people in the right direction. 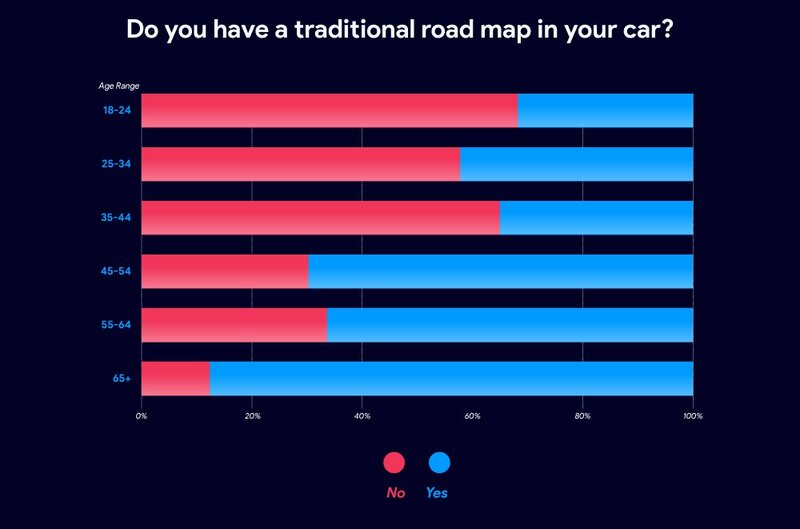 Unsurprisingly, almost 3/4 of drivers aged 65 and over said they would have no problem getting somewhere new without a sat nav or map application. If they get lost using a sat nav, less than 1 in 20 young people have a backup. Since we can’t all be trusted to use sat navs correctly, it’s understandable that almost 1/3 of drivers still frequently use a paper road map to find their way around. A staggering 58% of our respondents always carry an old-fashioned paper map in their car. Unfortunately, when looking more closely at these numbers, fewer than 5% of 18-24 year olds said they travelled with a traditional road map. This seems strange, considering so many of these drivers end up at the wrong destination anyway. 97% of young drivers would panic if their sat nav stopped working. What’s even more shocking is that fewer than 1 in 5 young drivers had actually used a traditional road map in their lifetime. So, if their gadgets failed, due to the battery, signal or any other reason, where would these young people be? Not having a backup could put you on the road to nowhere – in the literal sense. 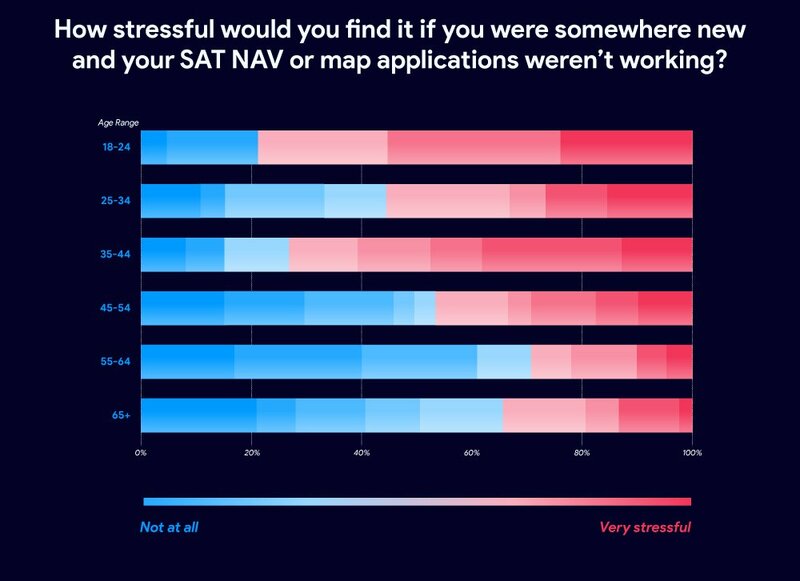 This feels even more unreasonable as a huge 97% of 18-24 year olds would feel stressed if they were travelling somewhere new and their map app or satellite navigation stopped working. With all the stories out there about sat navs taking drivers majorly off course, it seems foolish for so many young people to not even consider traditional methods of navigation. Only 1.5% of 18-24 year olds would be fully confident driving to a new location using just a paper map and road signs. 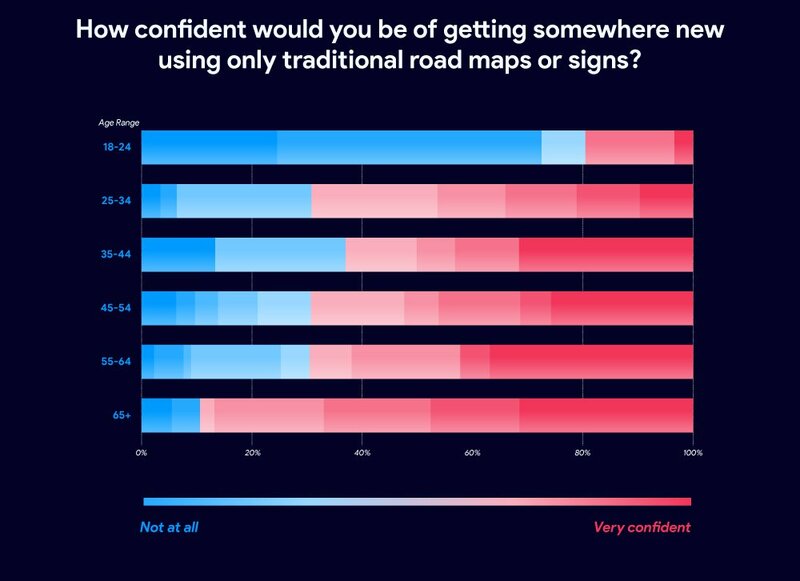 When it comes to navigating to a new location using only road signs and a traditional map, our survey revealed over a quarter of drivers would be completely confident in getting to their destination. If you’re trying to avoid solely relying on tech, you might think this is great news. However, very few of those respondents were in the younger age category. A tiny 1.5% of were aged 18-24, suggesting once more that young drivers are downright dependent on gizmos and gadgets. We already know so many of these tech-trusting youngsters admit they’ve gotten lost with a map app or satellite navigation, so it’d be understandable to question their rationality. But sadly, it’s not just the younger generation affected by sat nav overuse. More than 80% of older drivers feel sat navs have made their sense of direction worse. Research suggests that sat navs and map apps could actually affect our intelligence by essentially causing a part of the brain to shut down. Studies show that overuse of navigation tech can make your map-memory skills weaker, as you’re less likely to remember the route naturally and instead rely on the technology to guide you instead. Our findings infer the same thing, with over 1/3 of drivers revealing that map applications and satellite navigation have made their sense of direction worse. What’s more, out of those respondents, nearly 85% were over 35 years old. So, while older drivers might be less likely to depend on sat navs and map apps, a word of warning to those that do: they could be diminishing your brainpower. All things considered, it appears young drivers are putting too much trust in uncertain tech. 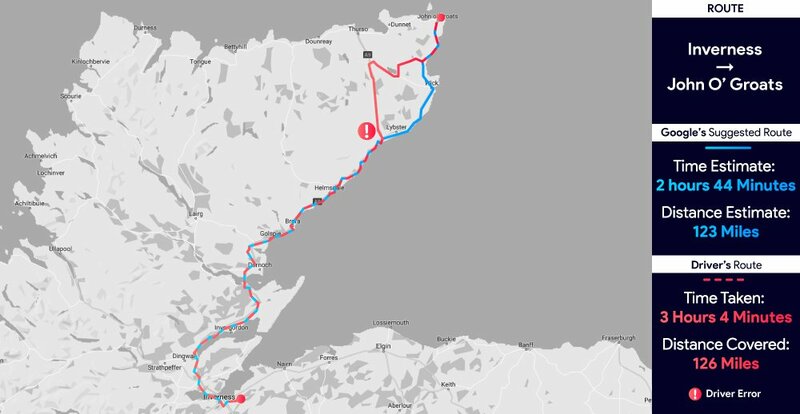 Most of the time, map applications and sat navs are their only source of navigation – and without it they’d feel stressed. Yet, at the same time, the majority of these 18-24 year olds still find their gadgets take them off track. Luckily, a lot of older drivers don’t completely rely on tech, instead preferring traditional paper maps and road signs. Then again, some of those who do use sat navs and map apps believe they cause a negative effect on the brain. To avoid this, we’ll just have to keep those traditional methods alive – and learn exactly how to read that old, dusty paper map. Putting it to the test: real drivers challenge themselves to travel to a new destination using only road signs and paper maps. 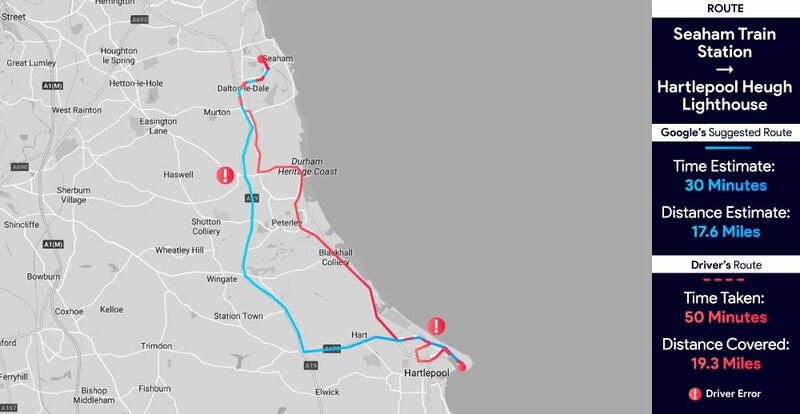 “I had trouble getting out of Newcastle as I thought both lanes went one way, but they actually split right at the last moment, which caused a bit of panic. But thankfully, I just went out the other end of the roundabout to get back on track. I then got into bother when I had to turn off the motorway and was confronted with a busy roundabout. I ended up taking the exit early and headed off in the wrong direction. I then got to a second roundabout and assumed if I just went back in the opposite direction, I’d end up back where I was. “The drive itself went well and I didn’t make any mistakes, but it’s interesting to see that there was a much quicker way I could have done. 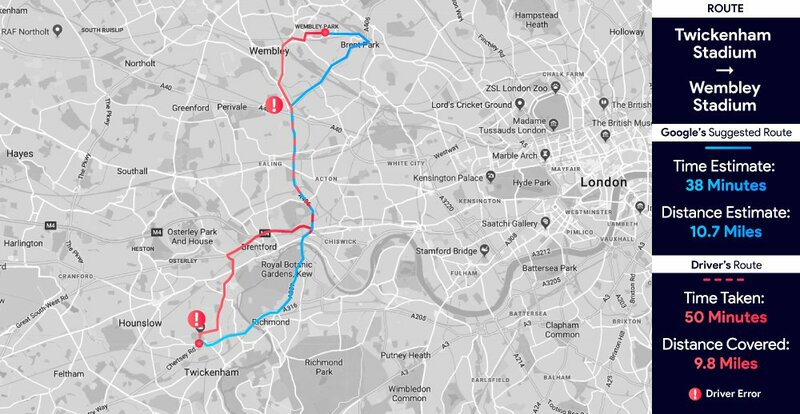 When I was planning the route on the traditional road map, I think I just went for whichever was the most logical to me, which in hindsight was possibly just the most direct route.